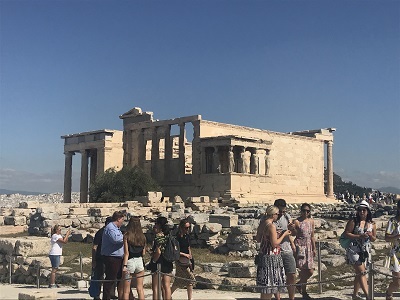 The Great EU Quest: Greece – The Acropolis! 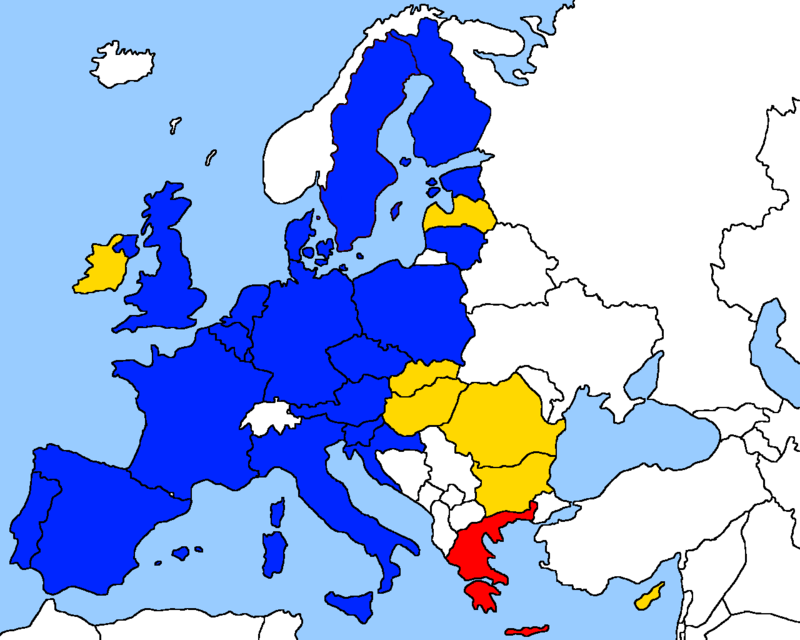 As I mentioned in yesterday’s post, I am finally crossing off Greece from the list of EU countries to visit. This really feels like the last truly major country to tick off the list and what a better way to cross it off officially than by visiting one of the major ancient wonders… more on that later. Getting to the apartment last night was a bit of a misadventure as a mixture of plane delays and broken ticket machines meant that we didn’t get in until gone 11. Thankfully the bed was comfortable and our temporary digs are exactly what we hoped for. It’s also cool that each apartment takes a name from a Greek god, ours being Dionysus. Due to our late arrival, we didn’t get up until about 9 (which for me on a holiday is rather late) and we made the decision to skip breakfast in order to get a start on the day. Of course the hundreds of local Athenians we came across doing a cancer run got a better start on the day than us. Oh well. Since our apartment is about 30 minutes walk from the Acropolis we opted to walk there so that we could start to get to know Athens just that bit better. On the way we passed an interesting landmark: the stadium that hosted the visit modern Olympic Games in 1896. Pretty cool to come across this just as an extra site! I had to photograph it later in the evening due to the sun being right overhead. A short hop from there was the first (of many) ancient sites of the day: the Olympieion. Back in the day this was a tall temple to Zeus, but now all that remains is 15 standing columns and 1 collapsed one. It really worked to see this first thing as we could still marvel at the height and not be spoilt by what is to come. 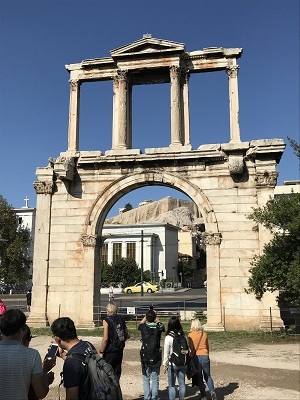 The Olympieion area also features Hadrian’s Gate which marks the then boundary between Ancient Greek Athens and Roman Athens. It’s amazing just how intact this particular gate. 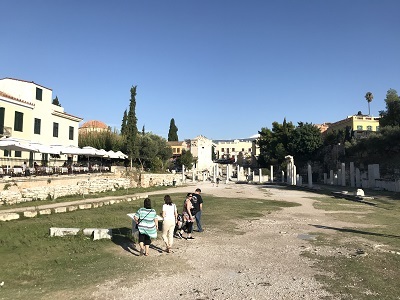 Also, if you stand in the right place, it provides a perfect frame for the Acropolis in the distance – our next destination. 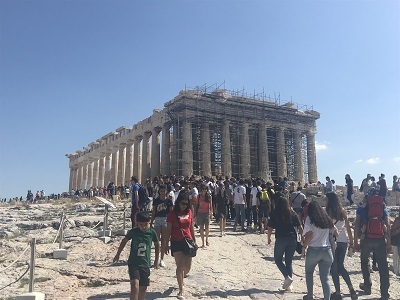 We got a tip online that if you want shorter queues to get into the Acropolis area not only should you pre-buy your tickets online, but go to the South-Eastern entrance. Most people tend to go to the western entrance as it is the more direct route to the Acropolis itself, but with the entrance we chose there was plenty of shrines and other ruins to see on our way up. 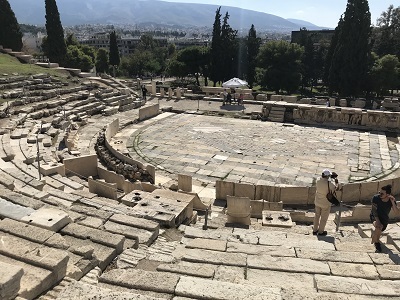 The big one to see is the theatre of Dionysus, whose area spans a lot more than you would first think. The ruins of the theatre is a real mixed bag. Some of it is amazingly preserved whereas others are completely missing. 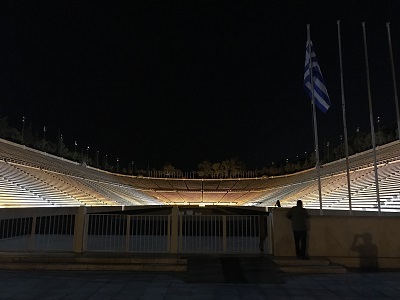 Still, it gave us a cool chance to take a seat in a proper Ancient Greek theatre – something that we will be doing again in a few days time… where I hopefully won’t regret not packing a cushion. After weaving in and around a number of ruins it was time for us to hit the big ticket item itself: the Acropolis itself. It’s worth mentioning at this point that the Acropolis is the whole area at the top of rocky outcrop. The major part of this is the Parthenon, but other ruins (including the incredibly well preserved ‘Old Temple’ to Athena) can be found up here. Also feral cats, but those really are everywhere in Athens. The weird thing about seeing the Parthenon for the first time is just how hard it is to process what you are being confronted with. Most of the times you see it in pictures you are seeing a zoom in from a nearby hill or the picture is being taken at a distance from a helicopter. Up close, it’s just difficult to parse the scale of the whole thing. 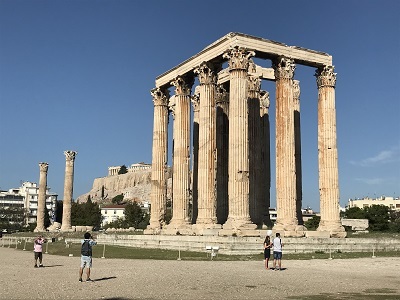 To allow the brain it’s time to process (and to get out of the way of some big tour groups) we went down to the ‘Old Temple’ to Athena (so-called because it predates he Parthenon as a place to worship Athena). It’s a bit of a marvel that is incredibly well preserved and has some interesting building quirks. This is a place that had to be built around a crack in the floor said to be where Poseidon struck the ground with his trident, the original olive tree as planted by Athena, the burial place of a mythic king and a substantial slope. 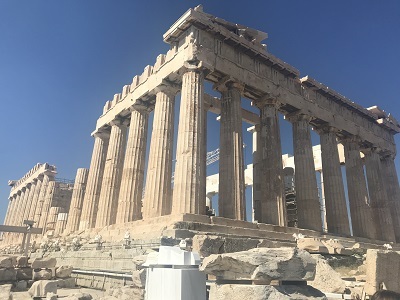 After this we still couldn’t quite process the Parthenon… so we climbed up a platform on the eastern edge of the Acropolis to take in some great views of the city (including a bird’s eye view of the Olympieion). I think it was the point where we turned around to face the Parthenon once again that it really hit us that we were here. The Parthenon itself is truly vast. I can only imagine how it would have been to see this before most of it was devoured by the explosion in the 1600s. It will also be interesting to see how it will end up looking after the restoration work has been completed – although this really does feel like a project that will never be truly finished. We ended up walking around the Parthenon itself two times to try and soaking he ambience as well as we could. It also afforded me the perfect opportunity to take a bunch of photos before we made our way back down the slope. I cannot over emphasise the number of great views that you get from up in the Acropolis – I can only imagine what it must be like to be there when it’s all lit up at night. After finishing our descent it really was time for some lunch, and what could be more Greek than gyros! 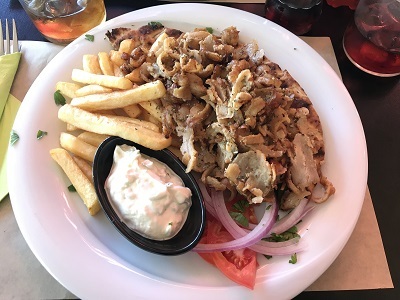 I feel that there is this big list of Greek food that I want it try authentic versions of whilst I am here – gyros being the top of that list equal to some proper feta cheese. We appeared to be the only people eating a meal of this size, but then again we had missed breakfast and (more importantly) who cares. 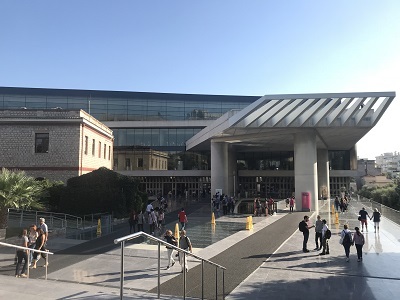 Next to the Acropolis’ slopes is the Acropolis museum – a newly built museum that houses all the findings from the Acropolis area as well as a lot of the original sculptures. However, before getting into that, we went around a temporary exhibition about Emperor Qianlong from China. This did serve as a bit of a palate cleanser for what was to come. 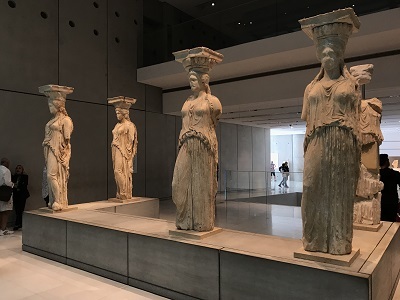 Sadly there is no camera policy in the vast majority of the Acropolis museum, so I’ll be brief. The sheer number of recovered statues and relics is truly overwhelming. There is so much that it makes you wonder just how much did not survive. Some of the best pieces are actually pre-Parthenon pieces that survived a massive act of arson by the Persian army. Some of these pieces still have visible paint on them! The elephant in the room if the Acropolis museum are the missing marble pieces that are currently sat in the British museum. Being a Brit, it’s interesting to hear the Greek side of the story – especially as they characterise Elgin as essentially being an upper class pirate. Who knows if this will ever be fully resolved to the satisfaction of both sides. 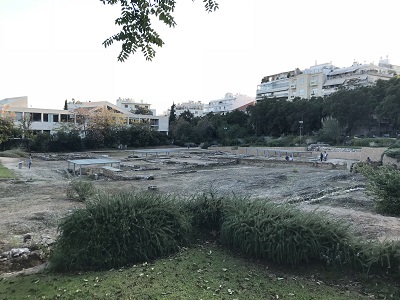 It was pretty late in the afternoon when we left the museum, so we had to prioritise some sites from our Archaeological Sites of Athens ticket (with the rest to be done in a few days). We made our way down a lovely promenade and some really touristy ships to the Roman Agora. There isn’t too much to this as most of the area compared to everything we’d seen previously, but it still had some columns and a gate intact. Also, and most interesting of all, the old observatory is nearly perfectly preserved. It really does help if a building has been buried for a long time. We had a bit of a walk between the Roman Agora and our final site of the day. 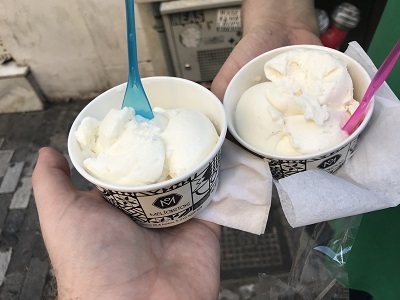 A walk which took us down some busy shopping streets and gave us the chance to cross off some ice cream. Salep ice cream has a number of names, which has made the hunt confusing. The Turks call it dondurma and the Greeks call it kaimaki. If I did not know this piece of information, I would never have found it today. The key feature of this ice cream is texture, which is like regular ice cream infused with an almost marshmallow-like stretch and chew. I really did like this ice cream and it makes me want to see if they have different flavours elsewhere. So we ended the day at the Lykeion, which was the most far flung of the sites on our ticket. It is also the flattest as pretty much nothing behind the foundations have survived to this day. We didn’t get a whole lot of time here as it was 20 minutes before closing, but we probably got as much out of it as we could. Still interesting to beamong history, even if it wasn’t entirely visible. For dinner, I found a place just around the corner from the apartment called Katsourbos. It was pretty high on Tripadvisor and apparently specialised in Cretan food. I guess that this sausage, which is meant to found all over Greece, can also be found there. 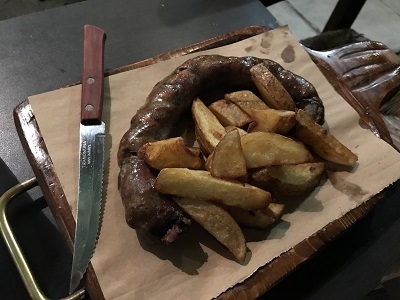 Now, I have had a lot of different sausages for this food list, but this Greek sausage (smoked and flavoured with honey, herbs and citrus) is truly something else. Sure is nicer than both of the sausages from the French box and it gives the Cumberland sausage a run for its money. Something tells me this will not be the only time I eat this before I leave Greece. 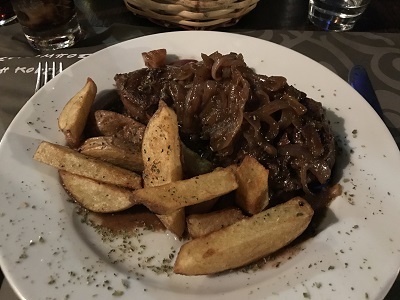 My main was liver with skin-on fries and a honey-balsamic sauce. I didn’t get this for the liver, I got this because the sauce sounded really interesting. Man, this really was a great sauce. I hope that I’ll find a recipe to replicate this as it feels like of those that could go well with a lot of different foods. I probably should have finished writing up hours ago as it is an early start tomorrow. How early, well we need to incorporate a 5 hour train ride. Wish me luck! Now that food items are becoming rare enough that I am only able to find them once a month or so, the ones in London with heftier price tags are becoming more and more enchanting. Especially when they’re actually cooked for me, which means I don’t have to fret about over-cooking or misusing them. 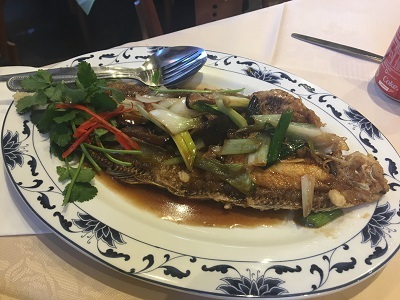 A number of restaurants in London’s Chinatown offer Dover sole (which I later found out is just the common sole – the name Dover becoming attached as the UK was the top supplier at some point) is pretty numerous. However, at £33 a plate, I have always put this off in favour of eating dim sum or some barbecue pork. Today was not that day. The moment the sole arrived at our table, I knew that the training I had gotten from eating whole barramundi and silver pomfret was going to bear fruit. It also helps that Dover sole is perfect to be served grilled whole as the fillets slip off the bone with just a little bit of pressure from the rim of a spoon. The only issue was where to put the spine. What can I say about the flesh, other than it was flaky, sweet and absolutely delicious. It was so good with the ginger, spring onion, soy sauce and mushrooms – the latter being incredible umami bombs when eaten with the fish. There was also a satisfying crisp crunch to the skin, which I only really started appreciating since I started eating special fish for this list. I’m looking forward to trying more fish in restaurants, but I don’t know how many more I’ll be finding in the UK. Hopefully I will be able to find one or two in Greece next week… but seeing how I wasn’t able to find anything in Freiburg I’ll have to play it by ear. Well here we are with the first Caribbean country, and I ended up going for one with a pretty flag. 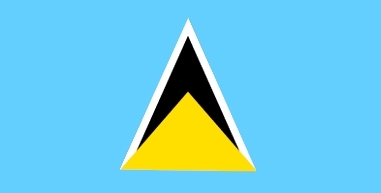 There are many other flags in this area that I really like, St Vincent and the Grenadines and Barbados both come to mind, but I ended up settling on Saint Lucia because of the striking light blue colour and because it has a bona fide national dish. Whilst the cuisine of Saint Lucia does share a lot in common with other nations in the Caribbean, there are particular quirks. For example, since this was previously a colony of France and Britain, the colonial influences can be felt in their food – as well as their being some touches from India (because, you know, empire). Having a national dish that is specifically Saint Lucian really helped to make this the first pick for this region. 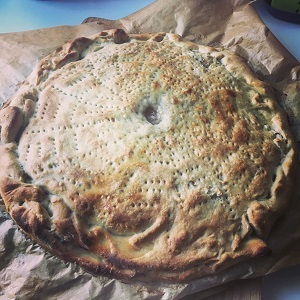 There are a number of dishes that I want to cook, like macaroni pie and bouyon, which can be found elsewhere – so will be saving those until later. The national dish of Saint Lucia is a confusing one, at least to a non-native. Why? Well, when they talk of green figs they actually mean green unripe bananas. Believe me, this was a relief as I have not eaten a fig since learning the whole thing about fig wasps – also it is incredibly easy to source green bananas in the UK. Similarly, since I live in London, my local Tesco superstore actually sells saltfish – meaning that this recipe was easy to buy for and cook. For my recipe I went to 196 Flavours and made the addition of some sweet chilli sauce at the end as it really felt like this recipe could use the kick. 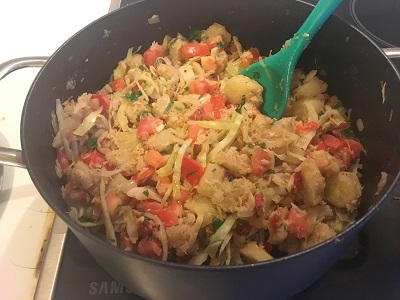 Not to say that it’s bland at all, but a recipe containing reconstituted salt fish, 1 kilo of green bananas and shredded cabbage doesn’t sound the most appetising – which was completely wrong of me. If you are able to get your hands on some saltfish, I would really recommend this if you are in the market for something a bit different. The recipe made enough for four, but myself and the husband ate this in one sitting whilst binge-watching The Middle. So easy was this recipe (and with the right spice level, this will be truly delicious) that it feels like a cool one to roll out if someone ever did an ‘Around the World Pot Luck’. Sadly I don’t live in the world of Desperate Housewives so it’s unlikely to happen – but hope springs eternal! For the next post I will be at country number 25, which just goes to show how seriously I took my husbands challenge six months ago. Since this is a landmark number, I really want to choose a country that could be considered a substantial cuisine. Not decided what it will be yet, but I guess you’ll find out in a few weeks when I have the time to get back in the kitchen. When it comes to picking countries to cook from I have tried to pick places that I haven’t visited before (other than Belgium, which was prioritised because of the endives). There’s no real reason for this aside from wanting to try new things and to avoid front-loading this project with foods that I already know and love. I’ll tick them all off eventually, but for now why not space them out? So today’s pick is Lithuania for the reasoning that I really wanted to fill in the gap on my map in the general Baltic Sea area. Also, I had a real urge to learn how to make cepelinai (giant filled potato dumplings in the shape of zeppelins). After all, with the colder months coming up, what better technique to learn than the art of making potato dumplings. More on those later, Lithuanian food is more than just cepilinai – although these are the national dish. The cuisine of Lithuania bears the mark of the many nations that once ruled over it and Lithuania itself once ruled – which means Polish, Russian and German influences. Many guides are less than complimentary of the food of Lithuania (and it’s neighbour to the north Latvia), but it suits me right down to the ground. This is a cuisine that heavily features seasons ingredients (including a lot of mushrooms), dark rye bread, meat, potatoes and a bunch of soups. You also find pastries and freshwater fish on many menus. Considering all this, there really was a lot of interesting things that I could have made… but my heart really was set on making some massive dumplings. Look at these monsters! To be honest I was white-knuckling as these bad boys were boiling as I had the awful feeling that I hadn’t sealed them properly or that they would just end up dissolving. Lo and behold that not only did they maintain the distinctive zeppelin shape during the cooking, but they actually tasted really close to those that I had in Vilnius. 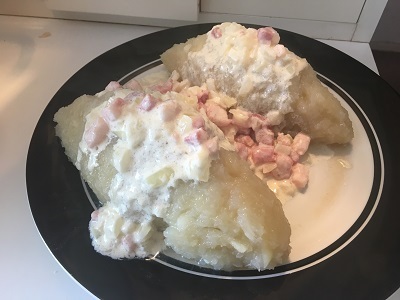 The recipe for these came from Lithuanian Home Cooking and I opted to make these just pork filled seeing how I was only making half of the recipe. Now, the big thing that I was not looking forward to was the endless grating of potatoes – but luckily the Kenwood I bought after the Russian incident (where my stand-mixer broke before being thrown out the kitchen and me then proceeding to cry in a heap on the floor) had a potato grating attachment for just this purpose. These zeppelins were absolutely fantastic, although in the future I would brown the bacon more the gravy. This gives me hope that, for a future Christmas meal, I will be able to make homemade potato dumplings. Maybe I’ll even make some for when I eventually cover Germany? One rule I have set for myself when covering an already visited country is that one dish has to be something that I haven’t already tried. 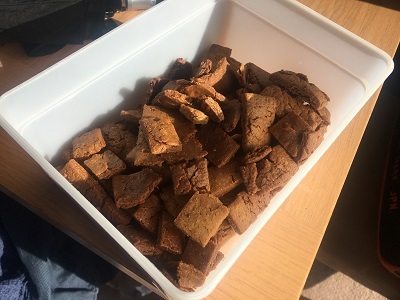 This is how I ended up with this recipe for tinginys (which translates into English as ‘lazy’), which is a really delicious cake-biscuit thing with very few ingredients and no baking needed whatsoever. I have a feeling that there are a huge number of recipes for this out there, but I ended up following this one from Ethnic Spoon. 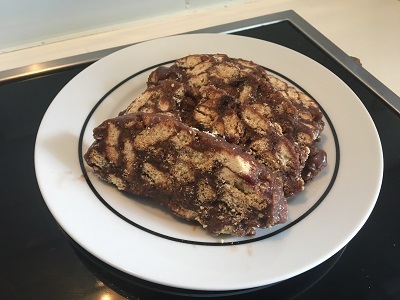 It’s fairly similar to recipes for chocolate salami or rocky road, but there’s no actual chocolate in this – just cocoa powder. Whilst this tasted great and, for some unknown reason, malty – I had real trouble getting it to set in the fridge even after leaving it overnight. A brief stint in the freezer more than made up for this shortcoming and I have been chomping on frozen slices of tinginys for the last two days. So, given that I’m going to busy over the weekends for the next month and a half, this will be the last food country that I will be posting for a while. Whilst the time taken to make the foods for Lithuania clocked in as one of the shortest – at 2 and a half hours – I won’t have the time to research, purchase and cook these entries for a while. When I return to this challenge, it will be off to the Americas once more where I will be looking to make my first foray into Caribbean cuisine. 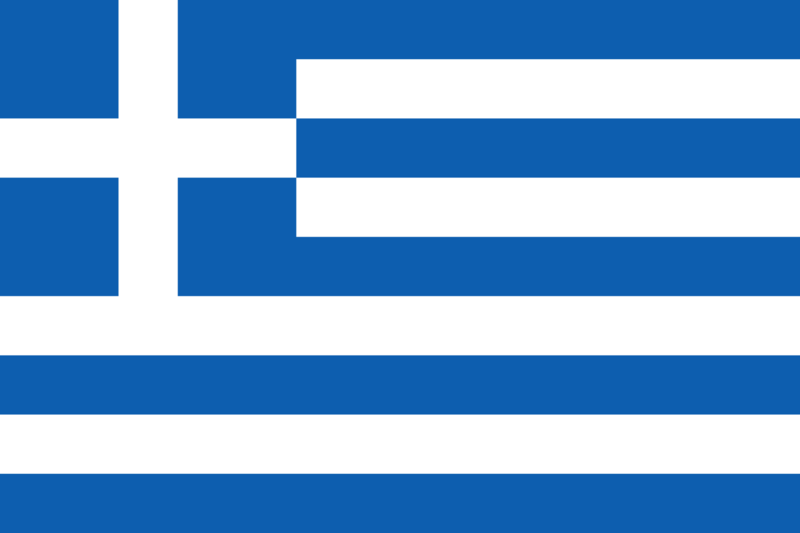 Will I go for an easy pick or just for the nation with the prettiest flag… at this point your guess is as good as mine. So here we are with the first Central Asian country tackled for this world cookery challenge… and it was a pretty last minute pick at that. This isn’t anything against Turkmenistan, just that I realised I hadn’t planned a country and pretty much chose this at random when looking at the map on my summary page. When thinking about what to make for Turkmenistan, I really had to be wary to not make something that I might want to make for the neighbouring nations. Like I have been finding with West Africa, there is a lot of overlap between the dishes found in Central Asia. Dishes like plov and laghman are common to the five central nations – but I’m thinking of making those for Kyrgyzstan or Uzbekistan. After some research I was able to find a consensus on a dish that is very much Turkmen and, from the pictures alone, I knew that it would be a good one to make. Being British, it’s weird to think of a shepherd’s pie (or a cottage pie) that does not include a topping of mashed potato. It is because of my dislike of mashed potato that I do not know how to make a British shepherd’s pie. It’s weird, therefore, that I now know how to make içlekli, which is a shepherd’s pie from Turkmenistan. I followed the recipe from Turkmen Kitchen when making this and opted to use beef rather than lamb because of my personal preference. As such, and probably because of the really fine beef, this pie sort of became a gigantic meatloaf in a pastry case – which was so so good. It was also fun to take some time to make a pattern with the holes. It’s really key to make sure the steam escapes as this is a very wet pie filling (which caused the greaseproof paper to fuse to the bottom of some of the pie. If I were to make this again, I would probably not add any extra water and, instead, add a whole beef tomato. I say if, but this is something I can really see myself making again. Especially as this is something that tasted even better when reheated for dinner. I’m going to be sticking with former Soviet states for a bit as I shift attention from Central Asia to Eastern Europe. Since I’ve never gotten around to making them since my holiday a few years ago, I figured now would be the time to cross off Lithuania and make my own zeppelins. Hopefully I can do them justice! When starting this quest I hadn’t quite counted on learning as much as I have about different cooking methods and about the different reaches of various colonial powers across the globe. With the various cuisines of Africa, it is quite mind boggling as to which European country’s influence is still felt. 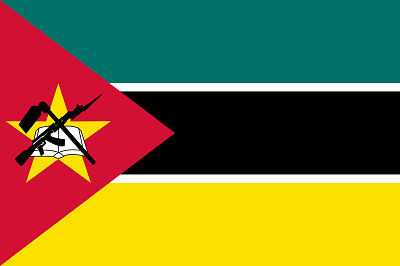 With Mozambique, I was surprised to learn how they were previously under the foot of Portugal until their independence in 1975. Previously, I had thought that Portugal’s influence was mostly in the area surrounding Angola – but no Mozambique, Tanzania and Madagascar have all had parts of their land within the Portuguese Empire. Considering Portuguese interests in India and Macau – it makes sense that they might have West African territories for sea-trading purposes, but the scope of some of these empires is just… beyond me. This is a bit of a round-about way of me explaining that, for this country, I made something that very much influenced by Portugal. However, the name ‘piri piri’ actually comes from Mozambique and is in reference to the type of chilli that was originally used. So I feel pretty good about making this to cross off this country. 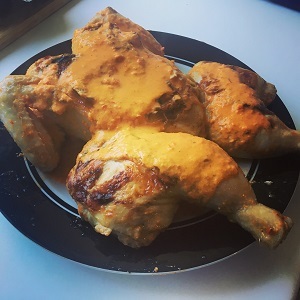 So this marked my first attempt at making Piri Piri (with the recipe from African Bites), as well the first time that I ever spatchcocked a chicken. The writer of the recipe mentioned it as a possibility for the sake of presentation, I just liked the idea of buying some proper kitchen scissors to try out a new technique. Honestly, I don’t know why I haven’t done this before, there is something rather satisfying about going through the cutting process in order to achieve a nice flattened chicken. My only worry was cooking it as, since I live in a flat, my options were to cook this in the oven or to find a way to fit it in my George Foreman grill… so of course I went for the latter. I ended up cooking the chicken for 25 minutes on the high setting and alternating between turning it and flipping it in order to make sure everything was safely cooked. The end product was a cooked through and incredibly juicy. Living in the UK makes it impossible to not compare this to Nandos (or Oporto from when I was in Australia). Fact is, this tasted different because of the use of coconut milk (which I’m guessing is a Mozambique thing… or might just be something that was omitted for UK tastes) instead of vinegar. 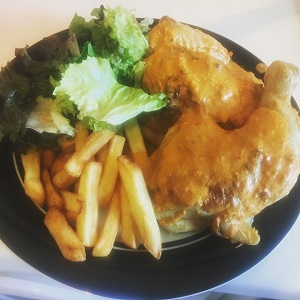 Whilst I still need to practice my chicken grilling skills, there is no question about how great the sauce was for the chips and salad (especially when mixed with a smidge of mayonnaise). Once I get the spice level of this perfect (which, for me, would mean adding more chilli) I think this is something I would happily trot out when having company over. It would probably make for a great vegetable or fish marinade too. Feels like it has been a while since I last made something Asian (which would have been the Bhutanese cheese curry) and so that will be my next destination. Looking at the map, it would appear that Central Asia and South-East Asia are the remaining areas that I have yet to touch properly – so I guess that’s where I’ll be looking to for inspiration. I speak for a lot of people in my generation when I say that the reason that I first heard of Albania was because of a classic Simpsons episode where an Albanian exchange student comes to stay. That’s pretty much it when it comes to Albanian characters that I’ve come across in pop culture – with the exception of the show that inspired today’s dish. 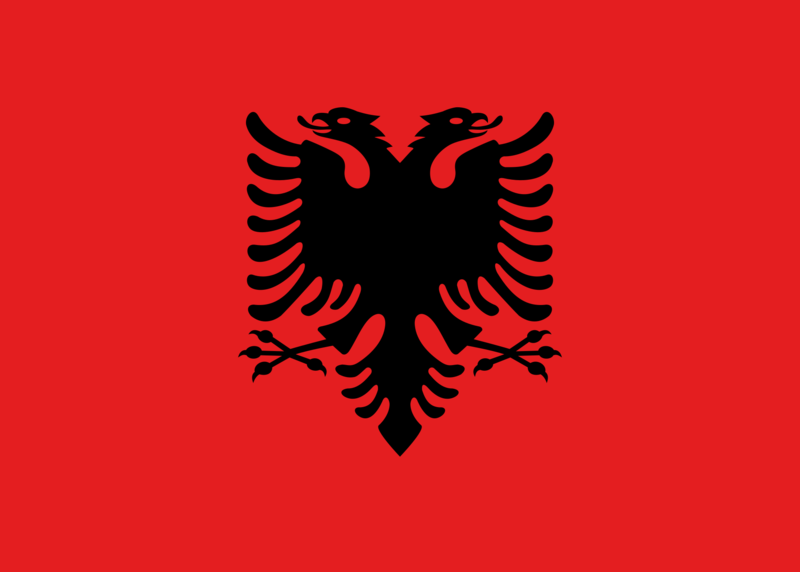 So thank you Archer for telling me about Tavë Kosi – the national dish of Albania. So aside from the national dish of Tavë Kosi what else is there in the world of Albanian cuisine? With Greece to the south, Italy to the west and the Balkans to the north – the food in Albania is Mediterranean with a Slavic twist. I really could have taken the opportunity to make an Albanian dessert (like their version of rice pudding that looks really nice), but after spending nearly a whole day making a Venezuelan cake… I thought I would take the week off. In the episode of Archer they make a big to-do about making this using the various cuts of meat from a sheep’s head (starting with the tongue and then the rest of the face). Whilst this would have been a novel way for me to cross eating sheep’s head off my my 1001 food list… I thankfully found a recipe (from the aptly named My Albanian Food) where I was able to use lamb shoulder. This recipe also, unlike the Archer version, did not feature mushrooms – which I think could have made for an interesting addition. 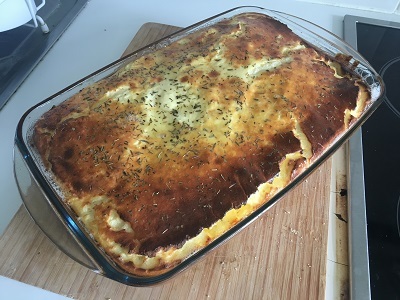 In essence, tavë kosi (which means ‘soured milk casserole’) starts with a mix of lamb, garlic, herbs and rise on the bottom layer and it’s covered in a layer of yogurt (with eggs and a roux mixed in) that’s baked in the oven so it has a golden crust on top. One thing I did not expect was how the whole thing just slid out of the dish and onto the plate – guessing that’s the rendered fat from the lamb helping out. I wasn’t sure what to serve with this, so I made some spiced couscous and a bit of garlic yogurt to have on the side. Tavë kosi appears to be one of those dishes where it’s best to sample both layers at once. The sourness of the yogurt layer really helps to cut through the gaminess and fattiness of the lamb – although I think I could have made this with two-thirds of the yogurt layer. Another cool thing about making this dish, I was able to cross another thing off the food list… which goes to show that there is still plenty of live in this list yet. I know that oregano was the herb used in the recipe (and that it is a very common herb in Albania) but I had a jar of Albanian savory in the cupboard… so I thought why not substitute it in. The smell and taste doesn’t exactly match oregano – in fact it’s more like a mix of rosemary, oregano and tarragon – but it really worked well in this dish. The smell of this mixed with the garlic really helped to overpower the strong smell of lamb (I really do not like cooking with lamb). 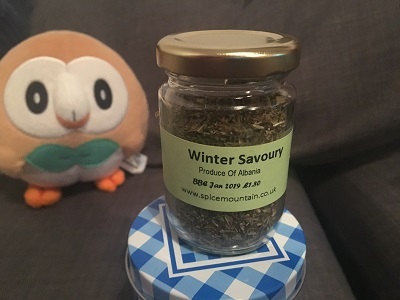 It also really reminded me of the bean soup that my nan used to make when I was younger, which means that I have had this herb before and I was unaware of it. I still have a lot left in this jar, so maybe I’ll see if there’s a way I can replicate that old recipe… and develop a taste for pot after pot of bean soup. 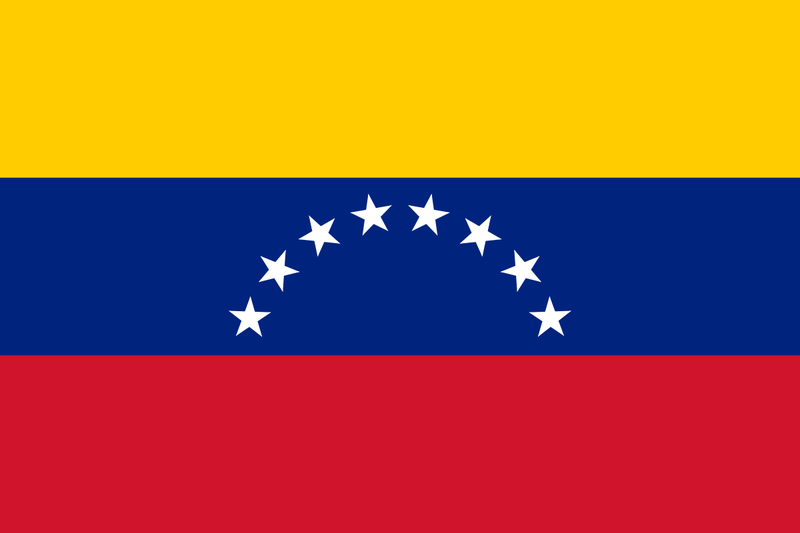 It is my hope on this rainy evening in August that, when this post is published next year, that there has been some sort of resolution to the current problems and food shortages facing the country of Venezuela. Like with my previous post making food from Yemen, it feels a bit off making food from a country that is currently experiencing so many problems. Hopefully things will be sorted soon. As I previously mentioned in my post making food from Chad, the reason behind Venezuela being today’s country is my very lovely neighbour and her daughter. Since I gave them a slice of cake that I made for Uruguay, I have received special maize flour and a recipe to make arepas for when I get around to Venezuela – so I had to expedite things so that I would be able to thank them… and then share some more dessert as further thanks. Just looking at the list of foods seen as Venezuelan reveals just how much the native pre-European food has survived and, in some cases, co-mingled with the cuisines of the Old World. My main course is an example of such a mixing… whereas the dessert is something that it very much influenced by the Spanish settlers. As a food stuff, arepas are nearly as old as you can get. They have been made for centuries by the original residents of Venezuela and are still incredibly popular to this day. 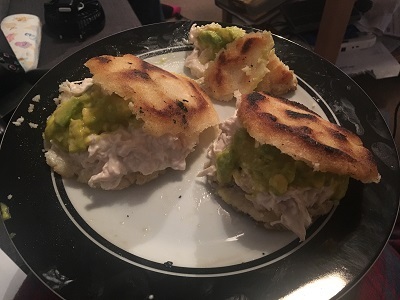 In this recipe, which translates to Curvy Queen arepas, we see this New World food filled with chicken mayonnaise and avocado. Not hard to believe that this combination is incredibly popular – I mean, why wouldn’t it… it’s delicious. Arepa are, in essence, a small round fried bread made from pre-cooked maize flour. They are similar to pupusa, but instead of filling them and frying them arepas are fried and then split to be filled with whatever filling you desire. I cannot argue with the use of shredded chicken, mayonnaise, avocado, lime juice and mustard when filling these arepas. Tastewise it’s a slam dunk, but it’s the texture difference between the thin crispy layer of the outside of the arepa and the cool and squishy chicken and avocado salad. I still have half a bag of this special flour left, so I feel like I have license to try and make more arepas with different fillings. Right so it’s been a month since I last made an insane cake – so why not make one that was even more insane? 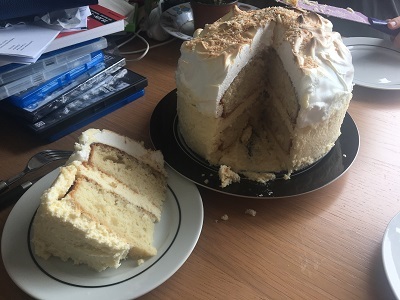 That’s what happened with this cake (whose name means ‘it tastes good to me’) where I had to make sponge, a coconut custard, a rum-infused sugar syrup and a topping of Italian meringue. Note: I have never made Italian meringue before. The name of this cake (recipe from The Spruce Eats) is pretty apt. It’s delicious and it looked so amazing when I first removed the protective cuff of my springform tin. The Italian meringue topping in particular looked glossy and gorgeous perched on top of the cake. Given the amount of coconut custard, I was so nervous that it would collapse, luckily it did not. In fact, it appears to be structurally sound and has lasted in the fridge for a few days without toppling over. It took a very long time to make this, but with a result like this… it was time well spent. Next time in my world cooking journey, I will be in Europe and sampling a dish that I first heard about from an episode of Archer. Any guesses of what I might be making? I wasn’t planning to hit the next landmark of my 1001 food quest in such a way, but it’s pretty cool that this completion happens as part of my world cooking challenge. Now, I’ve posted previously that I know will probably never complete this list. Some of the things are no longer being made and others are either threatened or endangered… which means it would be incredibly irresponsible for me to go after them. It will be interesting to see how far I get before, you know, the end of me. To mop up some of these final ones I will need to make special trips abroad and make some interesting substitutes along the way, but that’s half the fun of it. It has been nearly a month since my last food post, which just goes to show how much harder it has been to source these remaining ingredients. 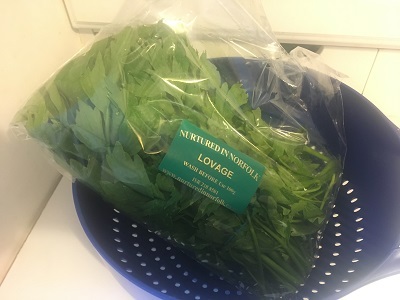 I almost didn’t buy this bag of lovage either as I had a sneaking suspicion that I had covered it not too long ago (I guess I was thinking about sorrel, which I did several months back). Good thing I keep an up-to-date list on my phone or I would have really kicked myself once I’d gotten home. Because of the Wikipedia page on lovage, I had the hare-brained idea of making a salad from the leaves and topping it off with some grated garlic and pepper Swiss cheese that I had also picked up from Borough Market. I hadn’t quite taken into account the intensity of flavour in the leaves… which made it fairly difficult to eat. Lovage is one of those interesting herbs because the different parts have intensities in same family of taste, but there is no denying the strong aroma. This is probably best described as if someone was taking celery and parsley leaves and then proceeding to shove them up your nose. It’s rather extraordinary. Last time I was left contemplating what area of Africa I was going to choose a recipe from. So instead for going for the north or for one of the Congos, I went for somewhere bang in the middle. I figured that this made for an interesting crossroads of Africa since it is right on the border of the Northern and Western regions – meaning that the food will take on the elements of the neighbouring regions whilst also bringing Central African things into the mix. Preparing this week marks the first time since South Korea that I specially ordered something over the internet to make a recipe. With Africa this might happen more and more often as they are more likely to use different flours than you would expect in a mainstream supermarket. It was a bit touch and go as my millet flour didn’t arrive until a day or two before I was going to start cooking, but it worked out in the end. This marks the fourth country in a row that I have made a main dish that doesn’t contain any meat (not counting the prawns in Palau). 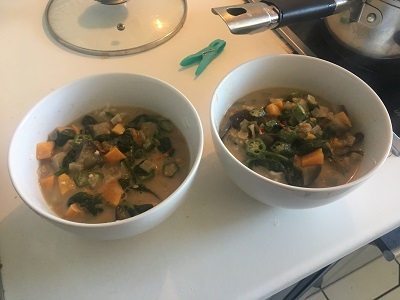 This also marks the second time that I have made a variation on the peanut stew for an African country (the other being from the Gambia). The thing is, when searching for Chadian recipes online, daraba is what seems to be the most popular. Of all the many recipes I ended up making this one from Dining for Women as it was the best one that didn’t just say bung everything into a pot and boil. I added a bit more peanut butter and some Maggi seasoning to boost the flavour (and some cornflour when eaten as leftovers to add some thickness). Honestly, I didn’t feel the need to include meat as there was enough variety with the okra, aubergine, sweet potato, tomato and spinach. I’ll try and not make peanut soup again for a while, but I think for smaller countries in West Africa I might have my hands tied. I guess I may just need to dig deeper for the likes of Togo and Benin. And here we have the reason for my ordering a bag of millet flour (that I now need to find other uses for) – some biscuit-type snacks that really remind me of shortbread. Well, a deep-fried shortbread that contains oil instead of butter. Still I followed the recipe from 196 Flavors and I ended up with a Tupperware tub full of these flaky treats. Having never worked with non-wheat flour it was interesting to see how different it was to handle. The main thing was the lack of gluten, which made it sandier and flakier to work with. I might have added a bit too much water in the end as I wasn’t too sure about how the finished dough should look – but it tasted food when they came out of the hot oil and that’s all that matters to me. So, when I did Uruguay I gave a bit of the delicious cake to my next door neighbour – after all, she’s been great and why not give cake when cake is available. Well, a week later we got a knock on the door and it was our neighbours daughter with bag of special maize flour for when I did Venezuela. A few weeks later she came by again with a recipe scanned from a magazine for something I could make with this flour. I guess that’s a long way of saying that, next time, I will be cooking something from Venezuela – now to find something sweet to go with it.